March 8, 2017 — I almost walked past about 50 Ouija boards without noticing them. Somehow. I blame it on the fact that I was in an airport. San Francisco International Airport, where I was not at all expecting to be suddenly surrounded by boardgame-shaped portals to hell. Plus I was beat. I’d just flown a cross-country route that had stretched to nine hours due to an unplanned stop in Denver because we “ran out of fuel” (spoken by the pilot like we just ran out of milk and our options were either to eat our Lucky Charms dry or hit the convenience store). I was tired. The kind of tired where the backs of my eyeballs ached. I had been up since 4 am to catch the flight. I’d been stuck in a middle seat. The movie selection had way too much Benedict Cumberbatch in it. How my friend, who was in the same straights as I, noticed the spirit boards, I don’t know. But, fortunately, he did. And pointed them out to me. And possibly regretted it because we spent the next half hour examining every single spooky letter of them instead of rushing to the hotel for hot showers and cold beds and mini-bars. 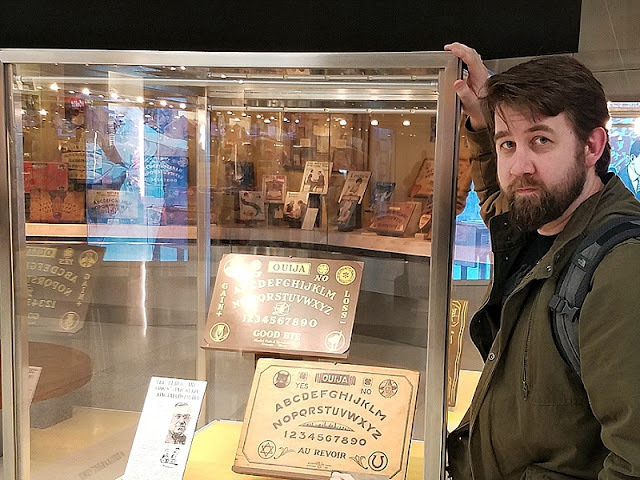 The exhibition was part of the SFO Museum, which is a museum of rotating exhibits spread throughout the terminals of San Francisco International Airport. The museum was established in 1980 to “humanize” the usual purgatory that is your average airport. 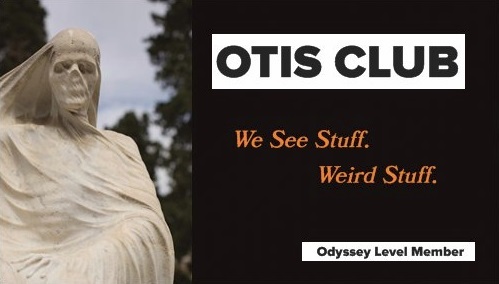 And what’s more human than disembodied spirits? Ouija boards are either an innocent way to pass a sleepover or a device for contacting demons and/or dead people, depending on who you to talk to. They typically involve a heart-shaped pointer device called a planchette, which the spirits (or the ideomotor response) move the planchette to a sequence of printed letters, numbers, and words on a board to form answers to any questions asked. 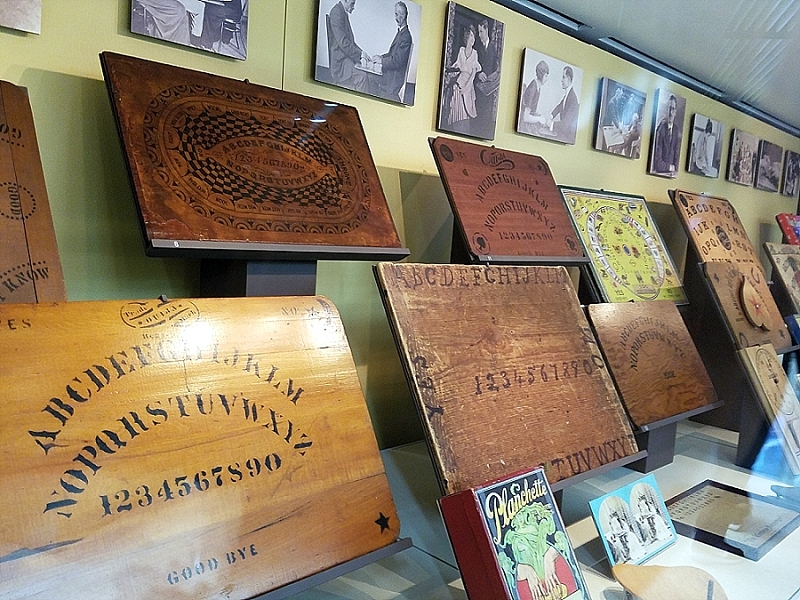 Actually, Ouija is a trademarked name. Owned by the Hasbro toy company these days. 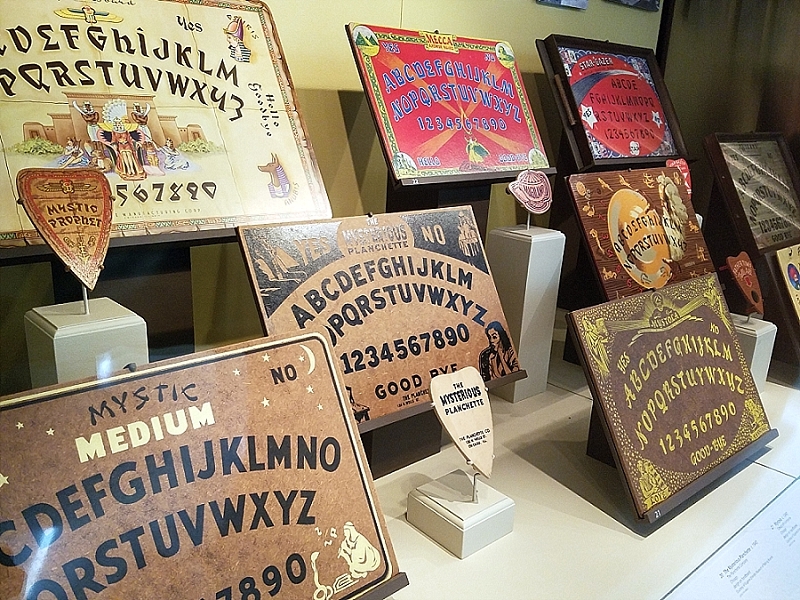 More generally, they're called talking boards or spirit boards. They have their roots in the practice of automatic writing, where spirits would supposedly channel messages through a host who would write down the messages from the beyond. The earliest record we have of somebody taking the short cut of using a board with letters and words for the same purpose was in Ohio in the 1880s. However, in 1890, a Baltimore businessman named Elijah Bond submitted a patent on the wordboard-planchette combo and so is, by the ineffable laws of intellectual property, officially credited with its invention. The rest of the story involves toy story aisles and horror movies and Christian panic and spooky people. 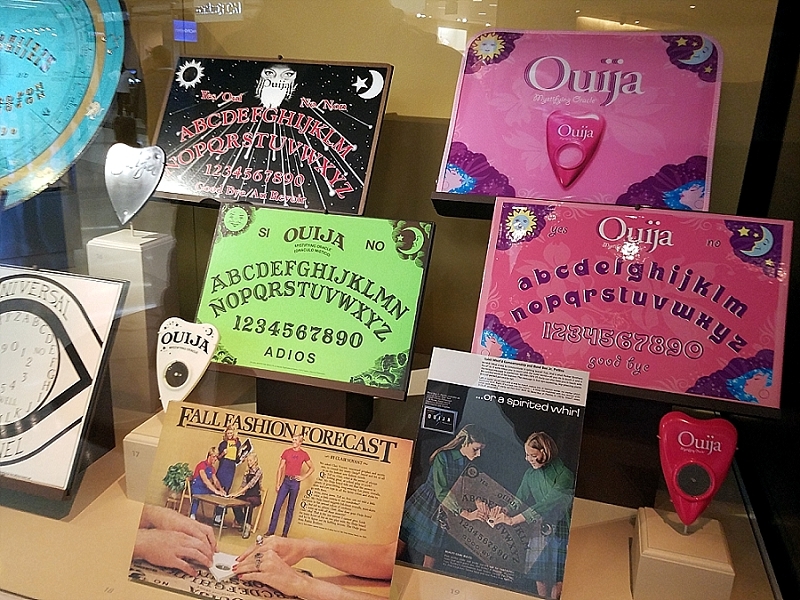 The Ouija board exhibit, called Ouija and Beyond, was installed in October of last year, but it has stuck around long past the orange and black squares of the calendar. 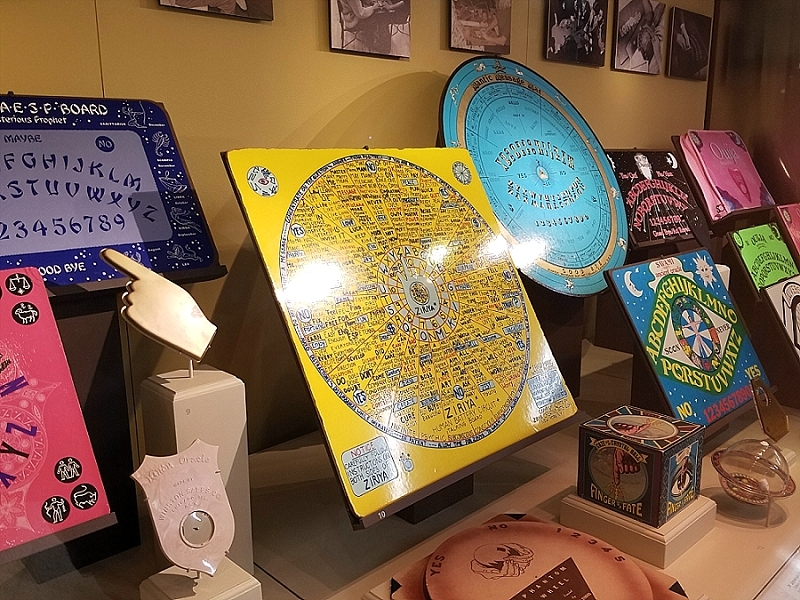 It was put together by Eugene Orlando of the Museum of Talking Boards (which features an adorable planchette-shaped cursor) and Robert Murch of the Talking Board Historical Society. I know. I didn’t know about either of those, either. Bookmarked. Inside the glass cases were gorgeous, simple 19th century wooden boards. Boards painted with mystical imagery like Sphinxes and the Zodiac. 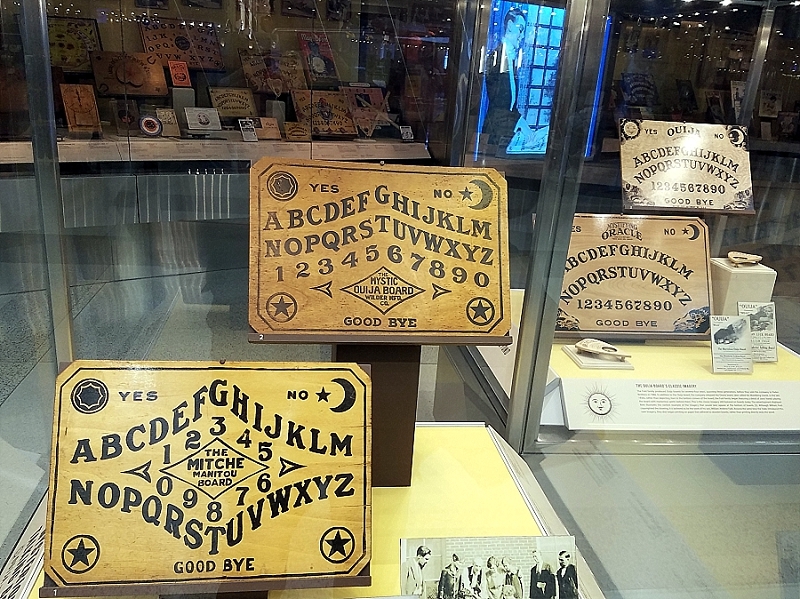 Original boards from the Kenner Novelty Company in Baltimore, which introduced the craze to the world. 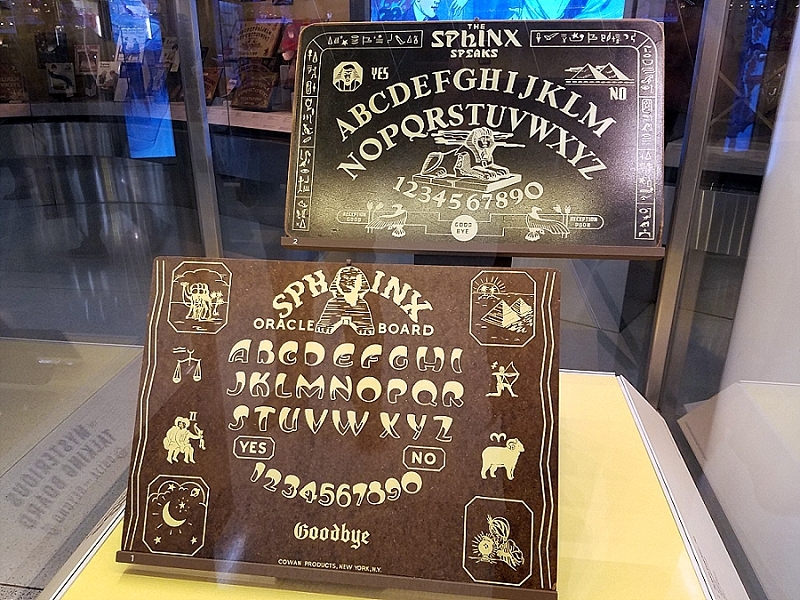 Variations on the structure of the board itself abounded, as well, like a box made by Milton Bradley where the top slid back and forth, highlighting letters with a peephole in the center of the sliding board (the “Witches’ Fortune Teller” was its name). Or a circular one filled with hundreds of tiny words instead of letters in case the particular spirit you were summoning didn’t have the patience to spell out BOO! (“Human Battery Circuit Talking Board” is what that one was called). There was even an electric one from the early 20th century. And, of course, all manner of planchettes. Basically, my friend and I were just a plate of glass away from summoning Captain Howdy and all his friends to run havoc at every duty free shop and Sbarro in the place. Let’s you and I write that screenplay together and get the cast of Second Sight to reunite and star in it. You can buy them at any Toys R Us. They’ve inspired an entire subgenre of horror stories. That one Parker Brothers commercial. The grave of their inventor. You must be a ticketed passenger to see the exhibition (Terminal 2 is where it’s located), and it runs through May 7, when, I can only assume, it’ll be replaced by something not nearly as cool as a piece of cardboard that bridges the visible and invisible worlds. Registered Trademark Hasbro.